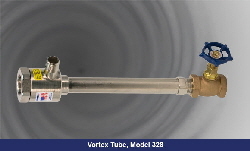 Vortex Tubes are an effective, low cost solution to a wide variety of industrial spot and process cooling needs. With no moving parts, a vortex tube spins compressed air to separate the air into cold and hot air streams. While French physicist Georges Ranque is credited with inventing the vortex tube in 1930, ITW Vortec was the first company to develop and apply this phenomenon into practical and effective cooling solutions for industrial use. Fluid (air) that rotates around an axis (like a tornado) is called a vortex. A Vortex Tube creates cold air and hot air by forcing compressed air through a generation chamber which spins the air centrifugally along the inner walls of the Tube at a high rate of speed (1,000,000 RPM) toward the control valve. A percentage of the hot, high-speed air is permitted to exit at the control valve. The remainder of the (now slower) air stream is forced to counterflow up through the center of the high-speed air stream, giving up heat, through the center of the generation chamber finally exiting through the opposite end as extremely cold air. Vortex tubes generate temperatures down to 100°F below inlet air temperature. 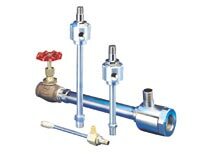 A control valve located in the hot exhaust end can be used to adjust the temperature drop and rise for all Vortex Tubes. Vortex Tubes have a very wide range of application for industrial spot cooling on machines, assembly lines and processes. BTUH (kcal/H) capacity based upon 70*F (21*C) compressed air dried to a dewpoint of -40*F (-40*C). Vortex tubes solve thousands of industrial cooling problems using only factory compressed air as a power source. A Vortex Tube converts ordinary compressed air into two air streams — one hot and one cold. With no moving parts, no electricity, and no refrigerants, a Vortex Tube can produce refrigeration up to 6000 BTUH or temperatures to -50F using only factory compressed air at 100PSI. A control valve in the hot air exhaust adjusts temperatures, flows, and refrigeration over a wide range. First discovered quite by accident by Georges Ranque, a French physicist in 1930, the effects of a Vortex Tube are still an unexplained phenomenon to many. Vortec Corporation was the first company to develop technology for converting the Vortex Tube phenomenon into practical, effective cooling solutions for industrial applications. For over 40 years, Vortec Corporation has been developing patents and technology to expand and refine Vortex Tube applications. The drawing above illustrates how a Vortex Tube works. Compressed air enters a tangentially drilled stationary generator which forces the air to spin down the long tube’s inner walls toward the hot air control valve, achieving sonic speeds of up to 1,000,000 RPM. A percentage of this air, now at atmospheric pressure, exits through the needle valve at the hot air exhaust. The remaining air is forced back through the center of the sonic-velocity airstream where, still spinning, it moves at a slower speed, causing a simple heat exchange to take place. The inner, slower-moving air column gives up heat to the outer, faster moving air column. When the slower inner air column exits through the center of the stationary generator and out the cold exhaust, it has reached an extremely low temperature. The volume and temperature of cold air produced by a Vortex Tube are controlled by the valve in the hot air exhaust. This volume (Cold Fraction) is the percent of total input air released through the cold exhaust. For example, if the total volume of compressed air input is 15SCFM and the Cold Fraction is 70%, then 10.5 SCFM exits the cold end and 4.5 SCFM exits the hot end. A high Cold Fraction. (i.e., more than 50% or the input air exiting the cold air exhaust), produces the maximum efficiency — the greatest BTUH output. This occurs at Cold Fractions of 60% to 70%, where the amount of air released at the cold exhaust and the temperature drop are optimized. Cooling machining operations, electronic controls, liquid baths, and workers will require high Cold Fractions for maximum refrigeration. A low Cold Fraction, (i.e., less than 50% of the input air exiting through the cold air exhaust), produces the lowest temperatures, but with reduced airflow. Colder temperatures are useful for cooling glass. laboratory experiments, and testing of electronic components. The Vortex Tube Performance chart shown below illustrates the effects different Cold Fraction settings will have on the drop and rise in Vortex Tube temperatures. Both the inlet pressure and the Cold Fraction setting are important factors in Vortex Tube cooling performance. The chart below assumes an inlet air temperature of 70F. Higher inlet temperatures, excessive moisture in the air supply, or excessive back pressure at either the hot or cold air exhaust will reduce the cooling performance of a Vortex Tube. 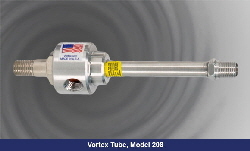 A clean Vortex Tube operating with a constant inlet pressure and temperature will deliver temperatures maintained within + or – 1 degree F.
Vortec’s four standard Vortex Tube models, each offering a variety of generators, provide the full range of cooling capacity that is economically practical for cooling with Vortex Tubes. This type of flexibility guarantees each Vortex Tube can be efficiently sized for the cooling needs of the application.